Reading aloud is an activity that most people are familiar with. Reading storybooks to children and grandchildren is a time for bonding, warmth and love. However reading aloud is not only for children; adults enjoy it too. For the elderly who loved to read all their lives, listening to someone read to them can bring profound comfort and joy. 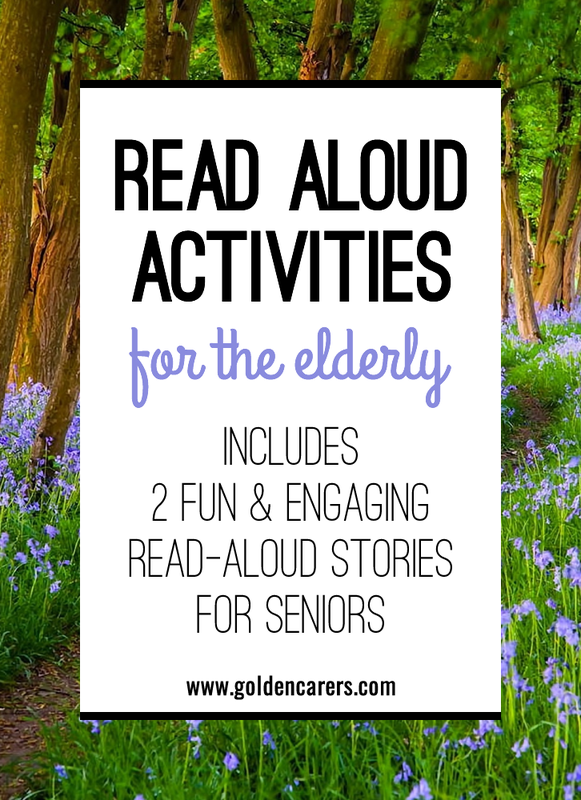 Sometimes read-aloud activities are lacking in nursing homes and assisted living facilities - however this can easily be changed. Why not start a Read-Aloud Readers Group activity at your facility; a Book Club with a difference! Read-aloud activities are an intervention well worth pursuing. There are many different reasons why the elderly may give up reading. Common barriers include poor vision, lack of strength to hold up a book, tremors, dementia, and other medical reasons. Giving up reading does not mean that they have lost interest in books, magazines, and newspapers however. In fact, losing the ability to read often leaves people feeling withdrawn, sad and isolated. Shared group reading can improve quality of life and wellbeing. Reading-aloud activities should also be suggested to families of clients who may at times run out of topics of conversation when visiting loved-ones. Reading-aloud is an intimate shared activity that promote feelings of closeness and attachment. Books chosen for read-aloud activities should be mainly literature-based, however other types of reading material is also necessary to attend to individual tastes. Ask clients what type of stories, news, and poems they enjoyed reading and make a plan for the group session. For clients who were never interested in reading books, see if you can spark their interest with books about hobbies, politics, current news, religion or cooking. There are books available that have been written specifically for dementia care. One of them is “Loving Voice: A Caregiver’s Book of Read-Aloud Stories for the Elderly” compiled by Carolyn Banks and Janice Rizzo. This book can be purchased online from Amazon:. Remind clients that it is important to have fun! Having fun is a good source of relaxation and stimulation. The goal of read-aloud activities is for clients to enjoy themselves. Read interesting and funny passages from these stories and talk about the book and the era in which it was written. Open-ended stories provide a creative way to engage clients in a story. Read a short story where the ending in inconclusive or incomplete. Clients may speculate how the story can continue, or how the problem can be solved. Write client answers on a white board and read them out at the end of the activity. (Example supplied below). Activity Coordinators may delegate reading-aloud activities to a willing volunteer after some training and observation. It is important to find someone willing to go to the trouble to prepare for the task. Both intonation and pitch can considerably influence how a story is received and comprehended. Here are some strategies that can make reading-aloud more effective. Read the story several times beforehand, become familiar with it. Practice the rhythm you intend to use; pauses and tone. Being present while reading is very important. Clients will lose interest if they perceive you are indifferent to the story or running on autopilot. Intonation is key to reading aloud. Read with your voice as well as your eyes - express emotion. Make the most of sentence structures, commas and interrogation marks. Pitch is important especially when reading to clients that may have hearing deficits. Make sure you read loudly and clearly. Adding pauses for emphasis is important to transport clients, momentarily, to the author’s world portrayed in the book. Observe if clients talk about the session amongst each other or with relatives. Keep note of the stories that attracted the most interest to read to others. Showing interest may mean a smile, a gesture, or a calm state of being during the session. Document findings. I read at a local retirement home. My sweeties,as I like to call them are all over 90 and are as sharp as tacks!They give me a run for my money (: Please keep posting reading suggestions, I struggle to find, short, but lively reads that will engage them and not insult their intelligence. They particularly like , olden day reminiscing stories. Thank you very much for sharing this with us Michael, this is exactly the style of short stories people are after! This sounds lovely Sue. Thanks for sharing this idea. Thanks Jill. We have had a number of requests for more short stories and we are working on it. The Scout website that Sharon shared with us also has a number of read-aloud stories you may enjoy: http://www.macscouter.com/stories/Participation.asp Thanks so much for your feedback! Thank you very much for this idea. My residents are all in their nineties and we read a humerous addition of The Wizard of Oz. Two of the residents enjoyed reading aloud. I have asked my residents what book they would like to read next. They have chosen Treasure Island and I am awaiting on the delivery of a large print addition. We are going to do this activity a couple of times a week for short periods of time to see if they are still enjoying. Hi Lesley Ann, thank you for the feedback, it is much appreciated. I am a therapist with the geriatric population at a state mental hospital. This is made up of dementia patients as well as those with other illnesses. Reading to them is very relaxing to them as well as me. I have a large collection of Chicken Soup for the Soul books. I have found the stories very well taken by the patients and the stories are not long. There is a very large collection (100+) books to choose from. I highly recommend them! Hi Jennifer, thanks for sharing. Hi Kath. I am just reading short stories like, Nurses of the outback. I just finished one that Slim Dusty's, wife Anne Kirkpatrick wrote ( I think that's her name). It was the story behind some of the songs she had written. I really enjoyed it too. We just have Lino floors. I read quite loudly for those who have trouble hearing. One lady sits right next to me as she loves the stories the most but has the most trouble hearing. Oh, and always have a bottle of water nearby.......dry throat. I love reading aloud to my residents, perhaps being an former teacher has helped. They enjoy the funny "Odd Spot" in our local paper and always want to comment. Cheers and keep up the good work- Golden Carers! Thanks for your feedback Karen, much appreciated! Nice work everyone. Keep up the good work/. I just recently started work at a DT. I do the sundowner shift in a secure dementia unit and after dinner decided to start reading to the residents. I pull all the chairs in close so that they can hear me better and I'll read for up to 1.5 hrs. They all sit and listen and very few wander. i choose short stories to keep their attention. It's really enjoyable not just for them but me too. Oh Julie what a wonderful outcome, so lovely to hear. That is quite amazing that you can engage them so effectively for such a length of time. Julie that's wonderful to hear, you must have a soothing and interesting voice. Does your facility have carpet/ good acoustics for reading? How lovely Lynn. Thanks for sharing.